The beginning hours of Mass Effect: Andromeda wasted no time putting me in a bad mood. Between the gutted character creation, inhuman facial animations, badly written dialogue, and awkward line delivery, it was almost as if BioWare did everything in their power to disappoint me. Fortunately, once the game gets rolling, it does improve. 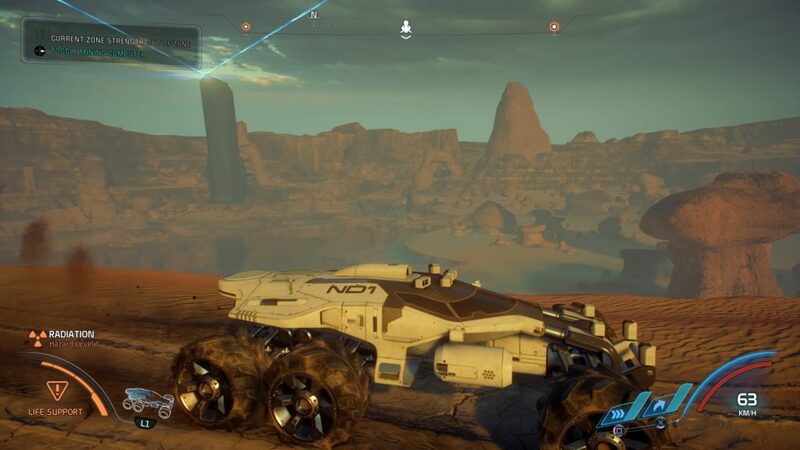 Combat is better than ever, and planet exploration in the Nomad reminds me of what the Mako in ME1 should have been. 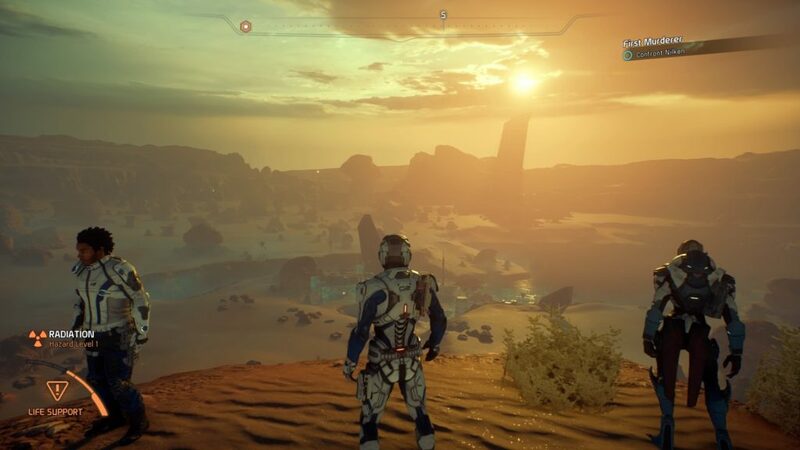 While the game does improve later and has an interesting premise, Andromeda fails to capture the emotional moments that put the Mass Effect series on the map. Mass Effect: Andromeda takes place over 600 years after the events of Mass Effect 3. Dubbed “The Andromeda Initiative,” inhabitants of the Milky Way galaxy set sail for a new beginning in the Andromeda galaxy. Once awaken from cryostasis, players have the option to play as one of two characters: Sara or Scott Ryder, twins of the Pathfinder, Alec Ryder. 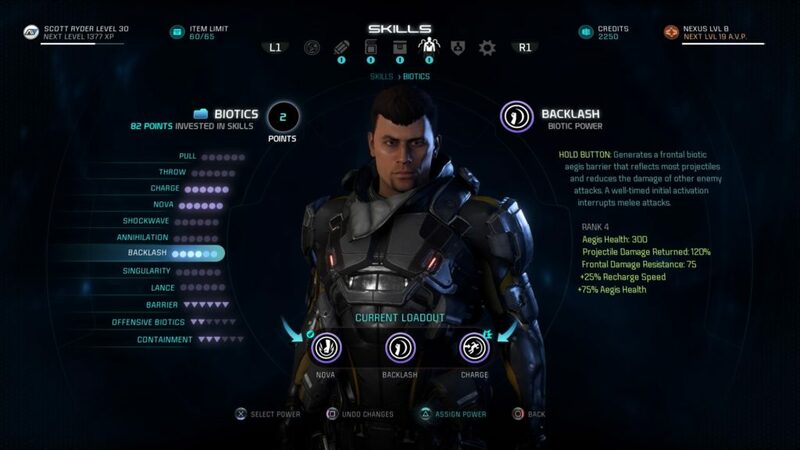 From here, much of the game revolves around one of the Ryder twins inheriting the role as new Pathfinder, a job responsible for surveying and establishing hospitable environments on potential Golden Worlds. Between mutiny, unforeseen environmental hazard, and a hostile alien race, the Kett, The Initiative is dealt far more than they bargained. The first few sections of the game are – to put it bluntly, a disaster. Right off the bat, players are met with a character customization generator that somehow took a step back in freedom. Instead of being able to cycle through various facial feature shapes, players can only choose between nine preset faces that are either ugly or barely passable, with the ability to only adjust the size and position of such features, minus the hairstyle. That put me on edge before the game even began. To add fuel to the fire, bad facial animations are everywhere, and the line delivery can get really… odd, not to mention the painful dialogue in general. The pacing of the story also feels a little rushed and pretty dull. Minor spoilers, Alec Ryder does not live, and his death comes way too soon. His demise would have been much more impactful had Scott/Sara Ryder had not been named Pathfinder so soon. Instead, a section of the game should have had Ryder relying heavily on his/her father for Pathfinder duties, while also building a more defined relationship. Problems like these are acceptable on their own, but there are so many early on, you can’t help but notice all the flaws, unintentionally ignoring the positives as a result. Fortunately the game does get better, but it takes way too long to get to that point. 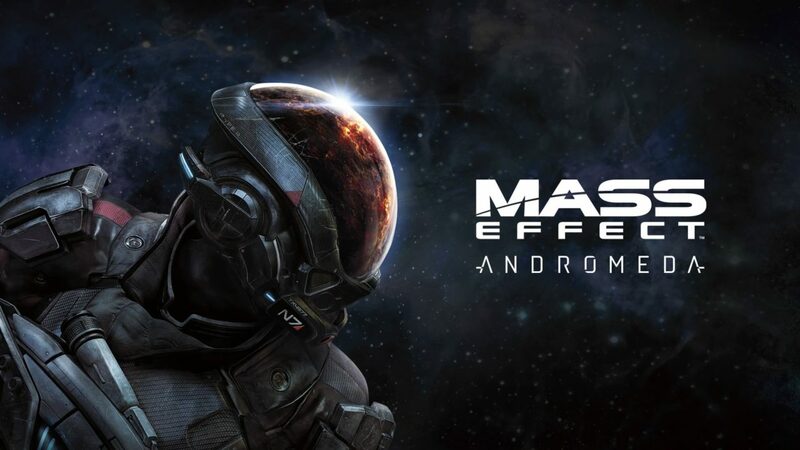 Most people love Mass Effect because of its story and character interactions. While I liked the premise and most of the crew, everything just felt mediocre. Thinking back on the story, I can’t think of any defining moments that resonated as strongly as the Virmire mission in ME1 or the Tuchanka section in ME3, just to name a couple. Only until the very last mission does the story feel like it’s about to go somewhere and really reach some kind of payoff. The narrative just seems incomplete, and you don’t learn much of anything about the Andromeda galaxy as a whole; too many plot elements seem to be saved for the sequel and that was a bad decision. While few characters reach the awesomeness of a Garrus or Tali, they were still interesting enough to make me care. This mostly had to do with the great and plentiful crew interactions both on and off your Tempest ship. The Tempest sections are perhaps the best executed ship sections in the series as far as making the player feel like they are part of a real crew. The crew have many dynamic conversations between each other that last throughout the game, and there are nice little touches in the environment that make the ship feel like it’s been lived in for an extended period. One of my favorite squadmates was Drack, a very old Krogan who’s seen his people rise and fall. His centuries of warfare has reduced much of his body to synthetic parts and shaped a more level-headed attitude than most other Krogan. The loyalty missions, while never reaching the memorable premises of Thane’s or Samara’s, are still the best missions in the game by far. With a new galaxy comes new species. Meant to capture a new sense of discovery very much like many experienced in ME1, I couldn’t help be disappointed that we only were introduced to two new species: the Kett and Angara. Being portrayed solely as the enemy, the Kett have little to explore, but they admittedly have some interesting plot developments. Regrettably, the game reaches closer to its conclusion by the time we learn anything interesting about them. The Angara, to me, just seem dull. They don’t have the distinct personalities or qualities of say the Hanar, Krogan, or the Salarians. The Angara claim they don’t inhibit the expression of their emotions, (or something of that nature) but we never see a good example of that – in fact they appear exactly the opposite. The premise of exploring and establishing settlements on alien worlds is an exciting one. Travel through each massive planet is made fun mainly due to the use of the Nomad rover. Unlike the Mako in ME1, the Nomad’s driving controls are much tighter and more satisfying. The terrain is varied and open, allowing the Nomad to cruise around and explore the stunning landscapes of each planet. The Nomad can be toggled to All-Terrain mode to climb elevated terrain and comes equipped with thrusters to hop over small obstacles and rear fuel injectors to temporarily boost speed. Combining these tools while driving provides just enough input to keep you entertained while traversing planets. Upgrades can also be purchased to further enhance the Nomad’s capability. The execution of the Nomad gameplay is really what the Mako should have been like in ME1. Combat is another strongpoint in Andromeda. Ground combat is, by far, the best in the series, mostly due to the jetpack working wonders. The jetpack opens up movement to an astonishing degree, an aspect the series was badly lacking. Quickly dodging attacks and jumping to higher vantage points is liberating, especially when accustomed to the tank-like mobility the series used in the past. One of my favorite things to do in combat is to jump and hover over cover to get a clear shot at an obstructed enemy; it never gets old. BioWare made the wise decision to grant players the option to use and swap out any power in the game at their convenience as long as they invested the skill points. I stuck to using biotic charge, focusing on a more close-quarters approach because that’s what I enjoyed most. Had I not enjoyed that style, I could have easily switched to a different playstyle. Andromeda is a massive game, and it would be torture to be stuck in one class you dislike for the entire game. Character leveling in this game is easily my favorite in the series. While it may be a little overwhelming at first, the robust options the player has opens up a great deal of skill customization. Players are also encouraged to choose a specialization class that provides bonuses to certain playstyles based on the amount of skill points invested in a given power category. The Adept specialization enhances biotic powers and changes your jetpack maneuverability to biotic propulsion. If you prefer Tech powers, the Engineer might be a better specialization. Side-quests are a mixed bag of good to boring. There are a TON of side-quests to explore that have a bit of story attached. Many of them become tedious as they tend to send Ryder on scavenger hunts across opposite ends of the map, when these missions could have just been concluded in one area. The thing is, some of these seemingly boring side-quests turn into legitimately interesting encounters or story points. It made me want to tackle every mission for better or for worse (I didn’t end up completing each one by the way). BioWare attempted to structure their side-quests in a similar manner to The Witcher 3, but they were far from successful at it. Anyone familiar with the multiplayer in ME3 should expect much of the same in Andromeda. Multiplayer consists entirely of cooperative hoard mode made popular in the Gears of War series. Players can then earn credits to buy packs of cards containing new characters and weapons of various rarity. I loved multiplayer in ME3 and put way more hours into it than I’m willing to admit. The version presented in Andromeda improves in some areas, and regresses in others. Naturally, with the improvements to mobility in single-player, the combat shines even more in multiplayer where the difficulty is dialed up to eleven. Many times I was able to get out of impossibly tight situations solely due to the flexibility of the jetpack; situations that would have been certain death in ME3. Since you no longer have to press a button to enter cover, less actions are mapped to the same button, therefore reviving teammates and providing a less cumbersome experience. There are also a bunch of little mechanical differences to character stats that make leveling a bit more diverse from character to character. Unfortunately, the little flaws to Andromeda’s multiplayer add up to sour my experience. It became the most apparent during my time in multiplayer that the sound design in combat is not good. Most weapons, from a sound standpoint, pack little punch; even the Widow, a powerhouse, anti-material sniper rifle sounds like a stapler. Biotic detonations lack that satisfying “boom” sound present in ME3. Heavy melee attacks are sadly gone which wouldn’t have been too big of a deal if the Krogan weren’t affected so badly by it. There were few things more satisfying in ME3 than performing a Krogan charge with your heavily melee, launching enemies twenty feet (Note I don’t count air ground attacks as a heavy melee replacement). Krogan headbutts barely have a sound effect, too; Krogans in general just don’t feel the same. The decision to reduce attack diversity is very puzzling to me. Don’t get me started on the removal of cover-grab attacks and reload canceling. Character leveling is more of a grind than before. Instead of leveling a class of characters simultaneously, leveling is painfully done on a character-by-character basis. Considering many weapons are weak, even at level 10, and characters haven’t reached a safe level to take into gold difficulty, you will be spending more time in bronze and silver, thus less credits and experience points are earned, further increasing the grind to improve characters and gear. To make matters worse, earning extra skill points by pulling duplicate character cards makes it just about impossible to fully level an ultra rare character at this time, even if you spend real money to buy more packs. The good news is some of these problems can be fixed with future patches. In fact, ME3’s multiplayer was in a similar state at launch with poor stat balancing and performance issues. ME3 took about a year to get to where it was, so it’s not necessarily fair right now to compare the two versions in some regards. There’s room for improvement and BioWare has stated they will continue to add more features and improve the game, which is reassuring. Facial animations and the overall look of humans have garnered an enormous amount of criticism from many. Except for alien species like the Krogan and Salarians, humanoids often appear robotic and ugly – more noticeably in female characters. It’s like the Milky Way shipped all of their ugly inhabitants off to Andromeda. 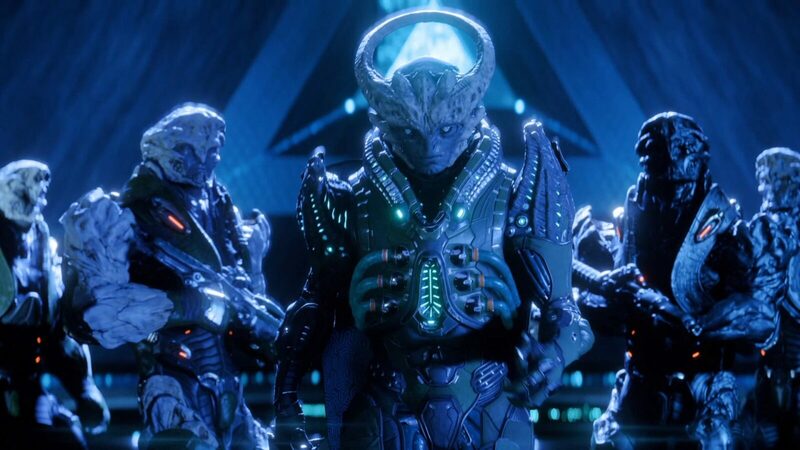 Most of the Asari look like they were stung in the face by bees; no exaggeration. A character’s looks are one thing, but the bad facial animations are inexcusable for a AAA game in 2017. One of the worst offenders not named Sara Ryder is from a character by the name of Foster Addison, who sparked many memes around the internet. At first, I legitimately thought her character may have been some kind of robot, but that wasn’t the case. Recently a patch was released that greatly improved Addison’s problem, but it shouldn’t have ever been a problem in the first place. The further into the game I got the less I noticed the poor animations, but I may have just become numb to it all by that point. On a more positive note, explorable environments contain some beautiful views that are worth a pause to soak in. As mentioned before, combat sound design is weak. Classic guns from previous games do not sound the same and lack personality. I liked the majority of voice acting in the game, particularly from squad mates, even if the dialogue was poorly written or awkwardly delivered at times. Scott Ryder sounded EXACTLY like Nathan Drake from Uncharted, which didn’t bother me, but for some it did. The music is almost nonexistent. Besides music being omitted from areas such as the Nexus hub area, I literally cannot remember a single song in the game; it was that forgettable. I may sound harsh on the game, but the truth is, I still enjoyed the game. I liked talking to my crew, engaging in combat, and driving the Nomad. I also got into the role of Pathfinder by improving the living conditions of each planet. Graphics aside, Andromeda is disappointing because its story is average. Nothing about the story sticks out as being amazing; it’s just okay. My thoughts on Andromeda are very complicated because it’s a massive game, with many flaws, but still fun to explore. To anyone still on the fence, wait until more patches are released and buy the game at a reduced price. Mass Effect:Andromeda has great gameplay, but a very mediocre narrative and poor character animations.